Pocahontas II: Journey to a New World is the sequel to the world renowned Disney’s Pocahontas film. 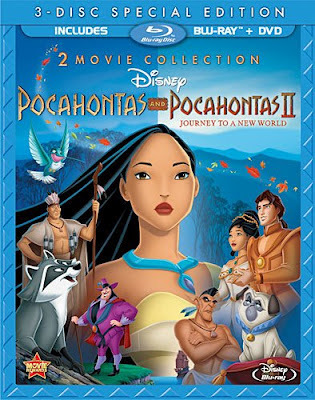 All the notable and favorite characters return with the exception of John Smith, while this movie was released more than a decade ago, is now re-mastered and available in a special two disc feature Pocahontas and Pocahontas II: Journey to a New World, available on Blu-Ray/DVD. Follow Pocahontas adventures in North America, and then follow her as she discovers the old world of England. This two disc combo pack is an excellent way to enjoy both of these films in the comfort of your own home. I remember when my daughter first watched this years back when she was a kid, and it's nice to see Disney bring back to relive these memories again.